ww2dbaseWilliam Franklin Knox was born in Boston, Massachusetts, United States. After attending Alma College in Michigan, he served in the First Volunteer Cavalry, as known as the "Rough Riders", in Cuba during the Spanish-American War. Returning to Michigan, he became a newspaper reporter. During WW1, he was an artillery officer in France. In 1930, he became part owner of the Chicago Daily News and became heavily involved in politics. In 1936, he was the vice presidential candidate for the Republican Party, though he lost the election terribly to Franklin Roosevelt of the Democratic Party. Despite being in an opposing political party, Roosevelt appoint Knox as the Secretary of the Navy in Jul 1940 for his internationalist views and for Roosevelt to gain unilateral support across political divides. Nevertheless, despite his earnest efforts in running the civilian side of the US Navy, he was often kept in the dark by both of his military and civilian colleagues. Assistant Secretary James Forrestal, for example, ran much of the department because he was closer to Roosevelt than Knox ever was. Knox had so much free time in this role despite the nation being in war that he still had time to run his newspaper in the afternoons. ww2dbaseKnox passed away in Washington, DC after a series of heart attacks. ww2dbaseSources: Naval Historical Center, Wikipedia. 1 Jan 1874 Frank Knox was born. 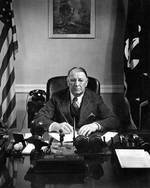 11 Jul 1940 Frank Knox took office as the US Secretary of the Navy. 24 Apr 1941 In a statement, Frank Knox, the United States Secretary for the Navy, proclaimed: "We can no longer occupy the immoral and craven position of asking others to make all the sacrifices for this victory which we recognize as so essential to us." 12 Dec 1941 US Secretary of the Navy Frank Knox departed from Oahu, Hawaii after personally inspecting damages. 28 Apr 1944 Frank Knox passed away. Searching for information on Frank Curtis. Worked for Frank Knox but not sure of position. I was told Undersecretary. I could be mistaken. Mr. Curtis commited suicide in Washington, D.C. around 1940. I would like to know if my family tree goes back to Frank Knox. My family comes from Clark SD. My grandfather was Clifford Jackson Knox. Can you tell me the route the Knox family took as far as where some Knox family moved to? Frank Knox''s parents came from Canada, his father from New Brunswick and his mother from Prince Edward Island. They moved to Boston and that is where William Franklin "Frank" Knox was born. Frank and his wife had no children.